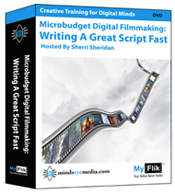 What went into Writing A Great Script Fast? There were other sources too but these above are the main ones. A great deal of time was spent weeding out information that was interesting, but not very useful for writing scripts. I then went and deconstructed 100's of films, TV shows, animations, myths and stories to find out how they really worked. All of this information was then folded into the step-by-step process that has been used by 1000's of people and continually refined over the last 10 years through much research, trial and error. When writing a script or a novel it is very easy to get lost, run out of steam or find yourself with a great idea that is missing something you cannot quite put your finger on but can feel it lacking. By going through this story building process you will fill out your idea in layers that play together like instruments in an orchestra. This step-by-step story engine process allows you try out 1000's of basic storytelling techniques at least once, while weaving together a great original tale. And the best part is that the next time you go to think up another story idea, you will remember many of the step-by-step techniques to help you craft great ideas fast for the rest of your life. Think of this workshop as a universal storytelling blueprint engine. You can throw any idea at it and walk away with a brilliant script idea in about 20 hours. Now how fun is this creative possibility if you are a writer or filmmaker? "A need to tell and hear stories is essential to the species Homo sapiens--second in necessity apparently after nourishment and before love and shelter. Millions survive without love or home, almost none in silence; the opposite of silence leads quickly to narrative, and the sound of story is the dominant sound of our lives, from the small accounts of our day's events to the vast incommunicable constructs of psychopaths."